The Dominican Republic proclaimed its independence from Haiti in 1844. 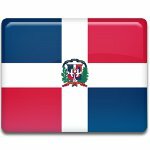 However, the so-called First Republic was short-lived: in 1861, Spain re-colonized the Dominican Republic. This move was widely rejected by the local population, which eventually led to a guerrilla war against the colonial authorities. On August 16, 1863, a group of rebels led by Santiago Rodríguez and Gregorio Luperón raised the national flag on the Capotillo hill in Santo Domingo. This event, known as El grito de Capotillo, sparked the Restoration War. On September 13, an army of 6,000 Dominicans captured Santiago and established a provisional government. Spain has a difficult time fighting Dominican rebels. Despite his reputation as a brilliant military tactician, General Pedro Santana was unable to suppress the Dominican resistance. After almost two years of fighting, Queen of Spain annulled the annexation of the Dominican Republic, and the Second Republic was established.